If you have ever tried to convert a Microsoft Outlook email message into a PDF document, you quickly learned how difficult it can be. PDF "printers" can save Outlook's print output as a PDF document, but they are unable to process the email file attachments, and generally don't perform very well. Convert Outlook Email to PDF, Free! 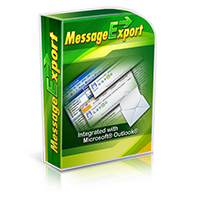 MessageExport is an add-on for Microsoft Outlook that can convert e-mail to PDF and many other useful formats. Following a free 15 day trial of the full version of MessageExport, the software will function in a limited but very useful "free" mode. 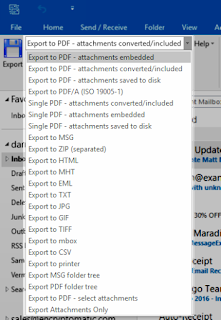 MessageExport's Free mode allows you to save any individually selected Outlook email message as a PDF document. MessageExport can convert email attachments, and perform additional tasks, such as copying the converted file to a specific location. Free mode is our gift to you for trying MessageExport. There is no obligation to purchase, and no pop up advertising or tracking. You can convert MessageExport from Free mode to the fully activated version by purchasing a license and activating the software. Our hope is that following your free trial, you will continue to use MessageExport, and maybe someday in the future, you'll want to purchase the full license. Until that day, we're happy to help you convert individual emails to PDF and any of the many other conversion formats that MessageExport supports. MessageExport brings powerful email convesion capabilities to Outlook. Thousands of people use MessageExport in free mode each day to convert email to PDF. 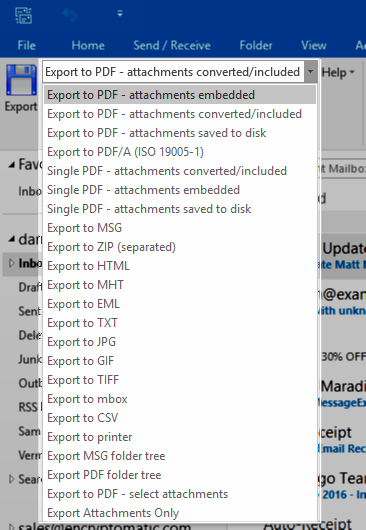 Since MessageExport handles file attachments, it is a much better option for Outlook users than a PDF print driver. While operating in Free mode, continue to use MessageExport as you did in the free trial. The only difference is that when multiple emails are selected, on the first message will be converted. This limitation is removed if the software is registered. 3. Click "Export" and choose a destination folder. You can convert Outlook to PDF, as well Gif, Tif, Bmp, Jpg, Png, Csv, Mbox, Docx, Odt, and other formats. We hope you find MessageExport, while operating in Free mode, to be a valuable tool that will enhance your experience with Microsoft Outlook. If you have any questions or feedback about MessageExport, post them in the comments below!